Special Containment Procedures:Only one (1) instance of SCP-LN is allowed to be kept under Foundation custody. Other instances of SCP-LN and victims' cadavers, either produced via experiments or encountered in the field, must be destroyed immediately by incineration. When not in use for experiments, SCP-LN is to be contained inside a three meters by twenty centimeters by ten centimeters (3m x 20cm x 10cm) metal box with a padlock. Nine (9) clamps, each able to withstand one (1) kilonewton of force, are to be installed at thirty centimeters (30cm) interval inside this metal box to restrain SCP-LN. SCP-LN's containment chamber must not have any fascilities that can serve as an anchor-point for hanging. All personnel, save for Class D personnel assigned for experiments, must wear protective cervical collars when handling SCP-LN. All experiment requests must be approved by Level 4 security clearance supervisors and carried out by research personnel with Level 3 security clearance. Description: SCP-LN is a hempen rope three (3) meters in length and one (1) centimeter in width. 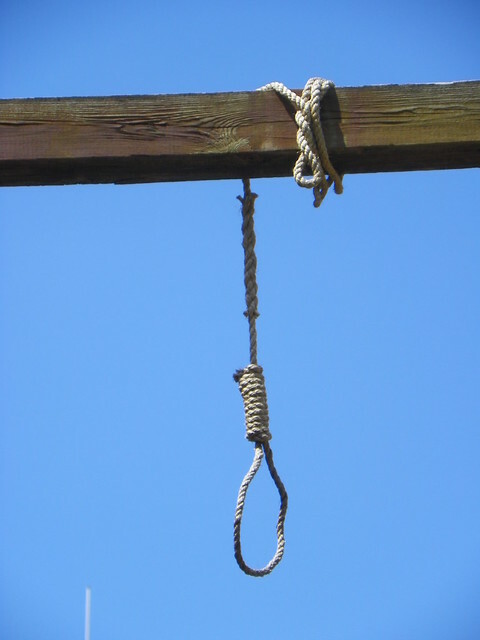 One of its end is tied as a "hangman's noose" knot with thirteen (13) coils. Despite how instances of SCP-LN are produced, DNA tests show that SCP-LN is composed of common Cannabis sativa fibers. Experiments also show that all SCP-LN's physical characteristics are identical to hempen ropes of same length and width. All staff members working with SCP-FTFM will be issued one (1) designated watch and must wear this watch at all times while working in SCP-FTFM project. This watch is designed to detect SCP-FTFM's Wi-Fi radio signal and display the accumulated time exposed to SCP-FTFM's Wi-Fi radio signal. Whenever SCP-FTFM's Wi-Fi radio signal is detected, this watch will emit a 50-decibel ticking sound that serves as a reminder. Staff members must have their watches checked by guards before entering SCP-FTFM's containment or before handling SCP-FTFM. Those who have their accumulated exposure time reaches eight (8) minutes will be transfer to other projects immediately. SCP-FTFM's mini-PCI Wi-Fi card is soldered to the main PCA board and cannot be removed. One (1) set of U.FL-RSMA pigtail connected with a 5-dBi wireless antenna is soldered to SCP-FTFM's mini-PCI Wi-Fi card. SCP-FTFM's 12-Volt female coaxial power connector is sealed with hot-melt adhesive, and requires no outside source of electricity to function. 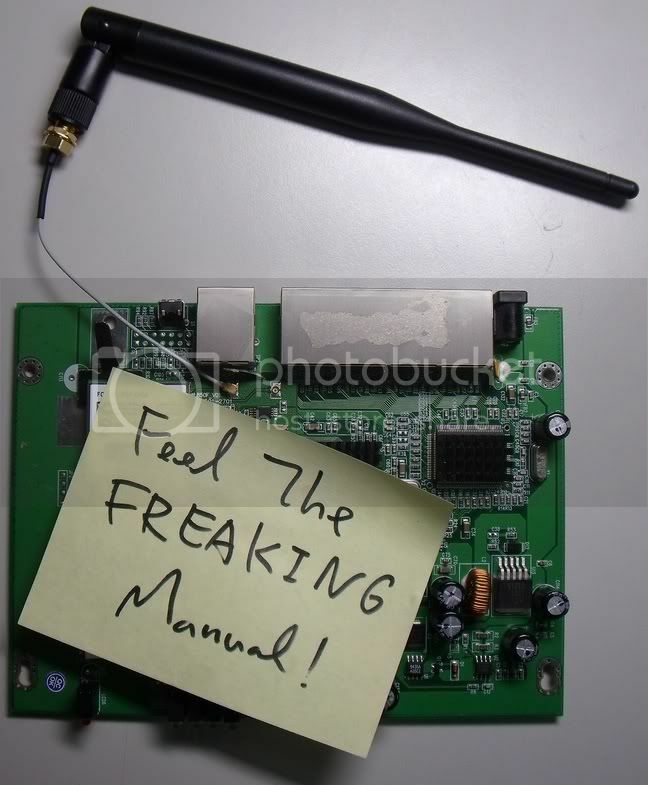 A Post-it Note that reads "Feel The FREAKING Manual" is attached on SCP-FTFM's mini-PCI Wi-Fi card. Like its ██████ commercial brand counterparts, SCP-FTFM works as a ordinary commercial wireless router. However, SCP-FTFM's memetic property manifests when a human subject enters its Wi-Fi radio coverage area. 30 Seconds Subject experiences dizziness, followed by a sudden gain of information about SCP-FTFM's basic functions, applications, and specifications. 8 Minutes Subject gains the knowledge about the basic concepts of computer networking and is able to set up a basic wireless network with SCP-FTFM. 20 Minutes Subject experiences a severe migraine. For the next ten (10) minutes, subject will gradually gain more detailed knowledge about computer networking to the extent of achieving nearly perfect score in C████ exam 640-802. Subject also gains knowledge of SCP-FTFM's more advanced functions such as setting virtual server or wireless bridge. Subject will express a strong desire to remain in SCP-FTFM's Wi-Fi radio coverage area and will act violently if removed with force. Also, subject will attempt to extend SCP-FTFM's Wi-Fi radio coverage area by connecting SCP-FTFM with other wireless routers and establishing any form of wireless bridge. 50 Minutes Subject will lose consciousness for about one (1) minute. Upon awakening, subject will start writing a user's manual for SCP-FTFM in an obsessive manner to the extent of forgoing its bodily needs. Subjects at this stage usually expires from malnutrition, dehydration or exhaustion. Special Containment Procedures: SCP-TMN-000050 is to be kept in a locked safe-deposit box. SCP-TMN-000051 may be accessed with a written permission from Dr. J██████. Due to SCP-TMN-000052's unique properties, all staff members are required to register the hexadecimal designation number used before mentioning/addressing SCP-TMN-000053 verbally or in any reports. Those who fail to do so or giving SCP-TWN-000054 any "nicknames" will be disciplined.